Bedbugs are blood sucking insects that have a flat head and a flat oval body. Young bed bugs are yellow-white in colour and change to a light reddish brown as they mature. They are about 4 – 5 mm long (less than ¼ inch). Small dark 'blood spot' stains on walls and sheets - stains are from bed bug excretions. Skins shed from the early life stages of the bed bug. Live insects - Despite their small size it is possible to see adult bed bugs. 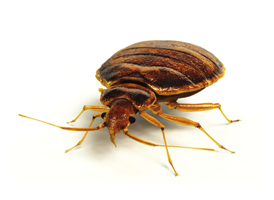 Bed bugs are not known to spread diseases. However, they can cause irritation and distress. Bed bugs can be difficult to get rid of without professional help. Our treatment involves a single visit. Cost - £84 (Up to 3 bedroom property).